Jigger, Mixing-glass, Strainer, Stirrer (long Spoon), Toothpick, Libra, Tablespoons, Martini Glass. 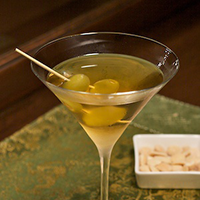 Stir into Mixing-Glass with ice, strain into chilled Martini Glass. Garnish with marcona-stuffed Olives. Dissolve 1 tablespoon of Sea Salt in 2 ounces of Water.